Is your organization looking to raise money for its mission? Why not host a fundraising packaging event? Feed6, through Outreach's innovative packaging event, can help raise money for your organization while making an impact on hunger in your own local community. Feed6 will partner with your organization in conducting a dual-purpose fund-raising event that will bring your organization and community together for an engaging, team-building, meal-packaging experience. 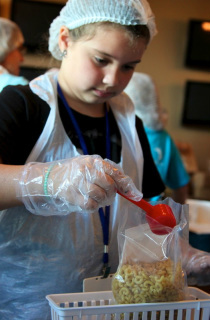 Meals generated at your packaging event would be distributed to local children and families in need through community agencies, food banks and soup kitchens. 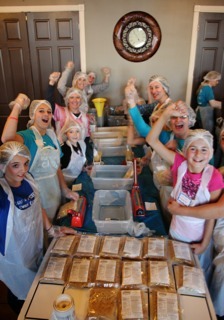 Meal packaging events are entertaining, giving, caring experiences in which whole families of every generation can participate. They create a sense of comraderie and reinforce the giving spirit of your organization and community. Many organizations that partner with Outreach participate in an annual or even semi-annual event. They are eagerly anticipated events, often with a festive atmosphere that includes music and refreshments. Those participating have both the satisfaction of helping to feed the needy in their community while supporting the organization’s mission.